All of the cottages for rent, available at RCNT Chalets, are equipped with a complete set of amenities, to make your stay with us as comfortable as possible. Our main objective is to ensure the quality of your stay by offering you a maximum of high-quality services. All of our chalets include a fully equipped kitchen with stainless steel appliances, washer, dryer and the possibility of a spa or a BBQ, depending on the availability of our cottages. In addition, since we have your comfort and well-being at heart, all our rental properties are equipped with a natural stone wood-burning fireplace, to make sure you stay warm on the cold winter evenings. 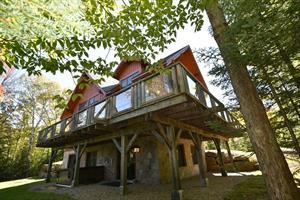 Come and relax in one of our chalet in the heart of the Laurentians, for up to 10 people. Alone, in couple or with a group, let yourself be amazed by the scenery and the unique atmosphere of Tremblant. 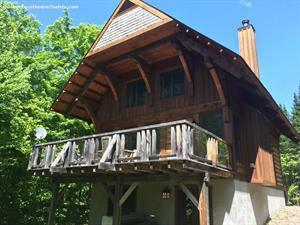 Our chalets for rent, on the north side of the Mont-Tremblant, have 2 to 5 bedrooms and up to 3 bathrooms with a shower or a bath for a supreme well-being. A wide entrance hall, a large dining room, a bathroom and a living room with plasma screen televisions, DVD player and satellite that will make you feel just like home, but in the countryside! Beautiful bedrooms furnished with a queen, king or twin beds and a large closet will add to your comfort during your stay at Tremblant. 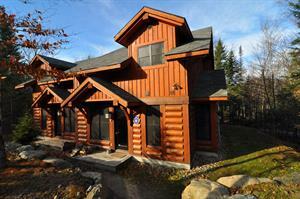 We wish you a great holiday at Tremblant, in one of our properties! Per weekend 2 nights 720$ Maximum 8 pers. Per weekend 2 nights 920$ Maximum 8 pers. Per weekend 2 nights 1200$ Maximum 8 pers. Per week 2275$ Maximum 8 pers. Per week 2900$ Maximum 8 pers. Per week 4050$ Maximum 8 pers. Per week - 5 days 1440$ (Lundi au vendredi) Maximum 8 pers. Per week - 5 days 1840$ (Lundi au vendredi) Maximum 8 pers. Per week - 5 days 2040$ (Lundi au vendredi) Maximum 8 pers. Our cabins are completely non-smoking, a $ 200 fee per day will apply in case of violation of this regulation. Pets are accepted in some units additional fee, the tenant must declare the presence of a pet during its reservation request, a fee of $ 40 per day up to $ 200 will apply to the presence of an animal. No excessive noise will be allowed after 23:00. RCNT Chalets will make no financial compensation related to the weather may cause an interruption of satellite television, Internet access, the? Electricity or water. We ensure to take steps to respond quickly to any of these situations. The customer is responsible and aware that the overuse of water in the cabin can cause a lack of supply of the latter during an indefinite period.